We’re slowly edging towards warmer months, but the New Year brings more than just the promise of more amicable weather; in a manner reminiscent of past years, industry M&A is off to an explosive start, as multinational drug firm Bristol-Myers Squibb announced within the first days of the year that it had entered into an agreement to acquire Celgene for approximately $74 billion – the biggest pharma acquisition ever. You can read the full story on our front page. Elsewhere, the World Health Organization has revealed an annual list of what it considers to be the greatest threats to global health, and there were a few surprises alongside expected dangers such as antimicrobial resistance, HIV and weak primary healthcare, including air pollution, climate change and vaccine hesitancy. You can find the full list on page 7. In R&D, new research has promised to fight cancer in a way that almost borders on science fiction: by converting the tumour’s cells into fat. You can read about the project, as well as exclusive commentary from the paper’s lead author Dana Ishay Ronen, on page 8. You can find these stories and many more in our latest issue. Also, be sure not to miss our full-length features exploring how artificial intelligence can address the industry’s drug development challenges, and why the counterfeit drugs problem is not what it seems. 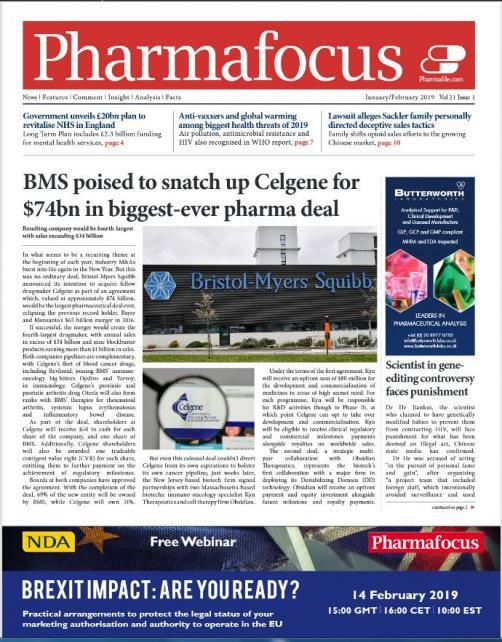 Read the January/February edition of Pharmafocus online now! The November 2017 issue of Pharmafocus is now live!